nected to the end of the airlift conveyor/classifier — all skid- mounted. CAB reports that Mr. Svobada anticipates a $75,000 savings by the use of the recoverable steel grit over other nonrecyclable sub- stances and a 50 percent increase in productivity due to lack of dust and improved visibility. The system also can be mount- ed on a 40-foot trailer and used dockside for blasting ships' tanks and hulls. CAB developed a weathertight blasting capsule for side-mounting on the hull of a drydocked vessel which permits recovery and recycling of steel abrasives. Either the skid or trailer arrangement can be used for work on the interiors and exteriors of large industrial tanks. D.C., is the contracting activity (N00024-77-C-4002). Commercial Barge Lines, Jeffer- sonville, Ind. Company literature describes the fiberglass covers that result in added cargo ton- nage, are one third the weight of steel covers, are noncorrosive, and easy to maintain. The Saudi Ports Authority re- cently awarded M.A.N, in Nur- emburg, West Germany, as gen- eral contractor, an order for three floating cranes with a lift- ing capacity of 200-tons each. The pontoons are being con- structed by M.A.N.-GHH Dock and Shipbuilding Company. They measure: length 60 meters, breadth 21.7 meters, trial run draft 2.38 meters, with a dis- placement of about 2,150 tons. March 1, 1983 are already in service, the new cranes are designed to operate without tug assistance. They will be equipped with Voith-Schneider propulsion systems. Gizan. Depending on the amount of work to be performed, it is planned to transfer the cranes from port to port without tug assistance. In view of the rela- tively high free-running speed of about 8 knots, a three-propel- ler system was selected. The total input power of each crane is 1,640 kw, distributed over two size 21 G 11/135 pro- pellers, each of 600 kw, and a size 18 G 11/115 VS propeller of 440 kw. The propellers are driven elec- trically by three-phase a.c. squir- rel-cage motors. To utilize the installed power as ideally as pos- sible for maneuvering and for the compensation of wind forces, the two larger propellers are ar- ranged at the crane-mast end of the pontoon, i.e., near the center of the lateral windage area. The Band-It tool quickly and easily secures the assembly. Band-It Division. HoudaiUe Industries, Inc.
A.L.Don introduces the 'Next Step' in pilot ladders. A.L. Don proudly introduces its new, improved pilot ladder—with steps you can replace quickly and easily, right on board your own vessel. A specially designed mechanical clamp holds each step in place. So there's no need to unstring the ladder. The A.L. Don Pilot ladder carries a U.S. Coast Guard approval and meets or exceeds all SOLAS regulations and IMO standards with features like a newly designed, non-skid surface... Steps painted international safety orange... Synthetic polypro-dacron suspension ropes with a white outer jacket and orange inner safety core... and bottom steps molded from a synthetic that can easily withstand loads of over 700 pounds with less than %" of deflection. The new A.L. 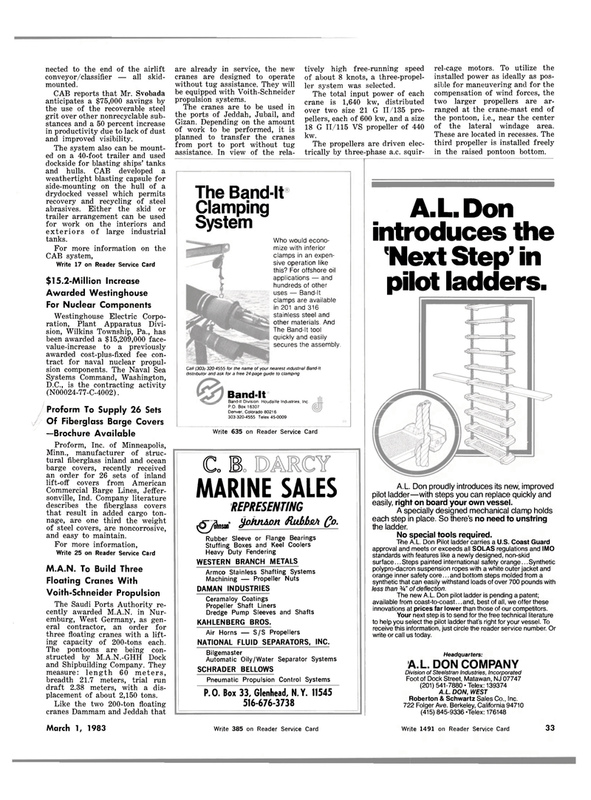 Don pilot ladder is pending a patent; available from coast-to-coast... and, best of all, we offer these innovations at prices far lower than those of our competitors. Your next step is to send for the free technical literature to help you select the pilot ladder that's right for your vessel. To receive this information, just circle the reader service number. Or write or call us today.